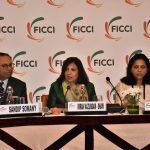 New Delhi, December 8, 2017: Centum Foundation, the philanthropic arm of Centum Learning, today launched a report on ‘Experiences of Deaf Employees in India’ at an event themed ‘Creating Inclusion for Persons with Disabilities (PwDs)’ at the Constitution Club of India, New Delhi to highlight the challenges faced by deaf at their workplaces in India. 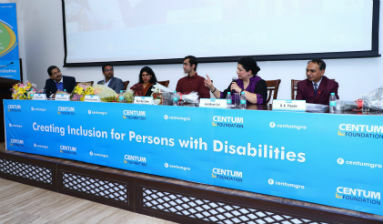 The bilingual (written English and videos signed in Indian Sign language) survey done by Centum GRO, an initiative of Centum Foundation to empower the Deaf in India, reflects the limited opportunities for the deaf, challenges due to limited accessibility and employers being unaware about creating inclusive spaces for the deaf. The report was launched by Ms. Dolly Chakraborty, Joint Secretory, Department of Empowerment for Persons with Disabilities, Ministry of Social Justice and Empowerment who was the Chief Guest at the event. A panel discussion was also conducted on ‘Creating an Inclusive Workplace’ which was moderated by Shrikant Sinha, CEO – NASSCOM Foundation. Some of the key panelists in the session were – Mr. D.K. Panda, Under Secretary, Department of Empowerment of Persons with Disabilities, Ministry of Social Justice & Empowerment; Ms. Aradhana Lal, VP Sustainability Head, Lemon Tree Hotels; Mr. Sanjaya Pradhan, Lead – Affirmative Actions, NSDC, Mr. Rajat Sachdeva, Alumnus, Centum GRO Initiative now employed with Boeing India Pvt. Limited and Ms. Sharmishtha Atreja, Professor, Delhi University. – Deaf employees do not like their work environment because of the feeling of being left out, getting strange looks from colleagues, rude behavior from colleagues, etc. The assembled dignitaries emphasized the significance of the Prime Minister’s vision of Skilled India and how transformation of the deaf people in the country is a key part of this vision. They also observed that it is critical for the industry and government to work together to achieve the mission.